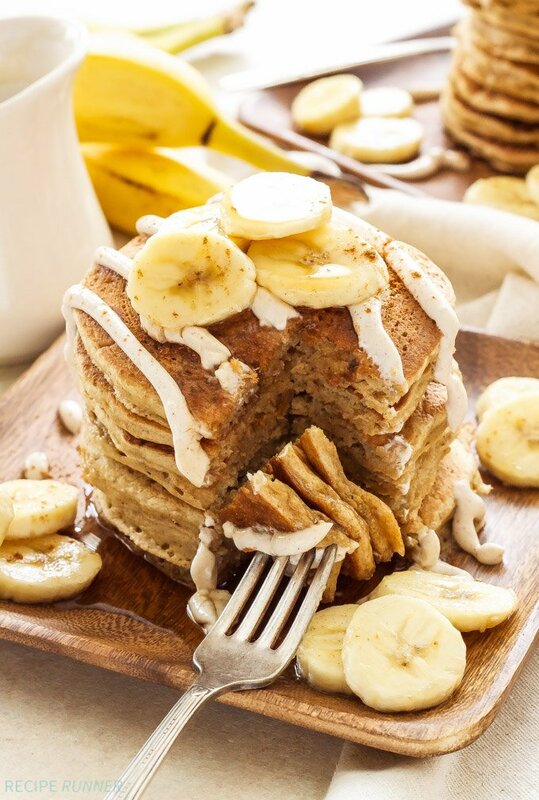 Pancakes that taste just like a slice of banana bread straight from the oven! 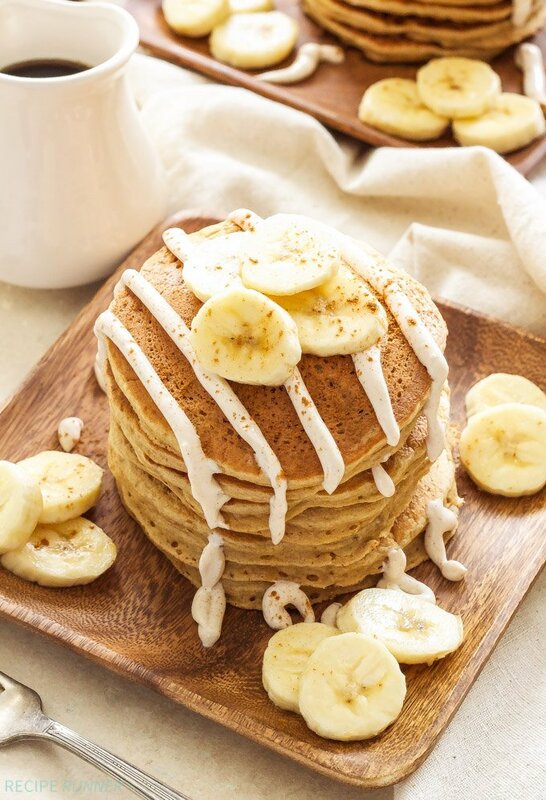 These Banana Bread Pancakes with Cinnamon Cream Cheese Glaze are a must make for your next brunch or weekend breakfast! Today we’re talking brunch my friends. It’s that magical meal that happens on the weekend and can last all morning and even into the afternoon. I love brunch because it’s a time to relax and indulge in a combination of sweet and savory foods. Most days we are so rushed eating our meals that we hardly even realize what we’re putting in our mouths. Not brunch though! Nope, brunch is a time when we gather with friends and family, fill our plates with far too much food, maybe have a mimosa or bloody Mary, then spend the next couple hours lounging around savoring the amazing food, talking, laughing and letting the time pass by without a care in the world. Brunch of course can be held any time of year, but I love a good spring or summer brunch because then you can enjoy it outdoors. I always feel like I eat slower and relax more when I’m outside. I suppose it’s the fresh air and taking everything in that’s around me. Enough about the atmosphere of brunch let’s move on to what’s most important, the food! The spread you put on your brunch table is limitless, anything goes. 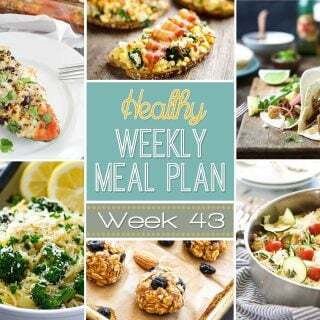 Eggs, bacon, cinnamon rolls, muffins, smoked salmon, crudities, casseroles, breads… I could go on and on. One of my favorite brunch items next to a big gooey cinnamon roll is pancakes. 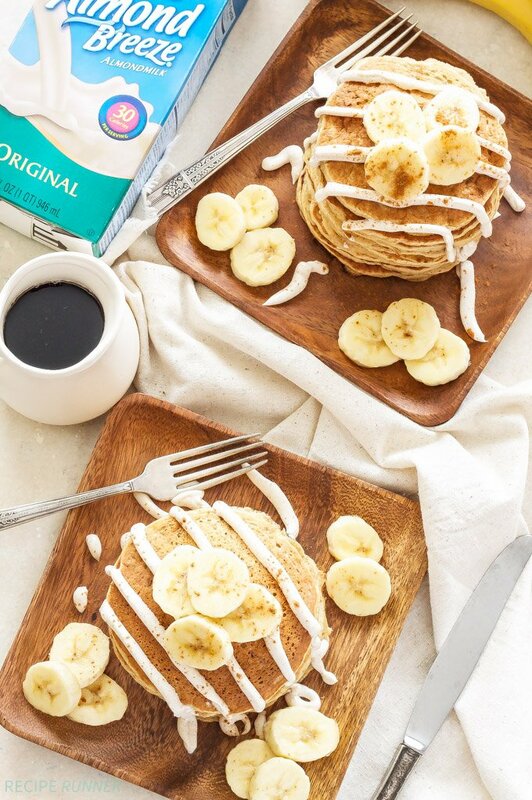 I always think of pancakes as a weekend treat, especially when you make them the flavor of your favorite quick bread and drizzle them with glaze like I did with these Banana Bread Pancakes with Cinnamon Cream Cheese Glaze. 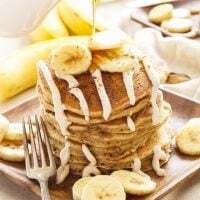 The banana bread pancakes not only taste just like banana bread, but they’re probably even a little healthier for you than a slice of banana bread. They’re 100% whole wheat of course, because that’s just how I roll with my pancakes. Most of the sweetness comes from the bananas with the remaining amount from honey. 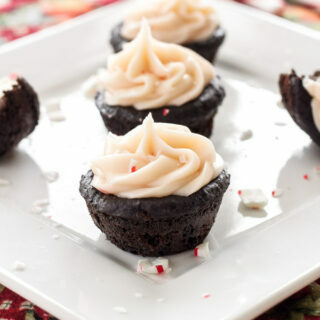 They also use Greek yogurt to replace the oil and Almond Breeze Unsweetened Original Almondmilk. Almond milk is my go-to for most of my baking, because of the lower amount of calories, carbs and I love that slight nutty flavor that it has. 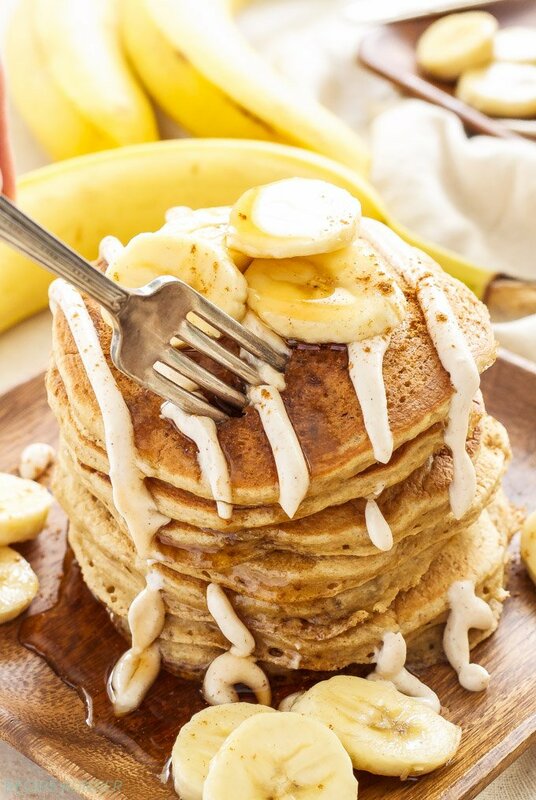 The final part of these banana bread pancakes which is optional, but highly recommended because this is brunch after all, is the cinnamon cream cheese glaze. It’s a little sweet, a little tangy and when drizzled over the pancakes and covered in maple syrup…perfection! Be sure to include these brunch-tastic pancakes to your spring or better yet Mother’s Day menu! In a smaller bowl mash the bananas then whisk in the remaining wet ingredients until combined. Pour the wet ingredients in with the dry and fold together until combined. Heat a griddle or non-stick skillet over medium heat. Spray with cooking spray then pour approximately 3 tablespoons to 1/4 cup of the batter onto the griddle or skillet. Cook on the first side until bubble form on top of the batter, approximately 2-3 minutes. Flip the pancakes over and cook on the other side for another 1-2 minutes. 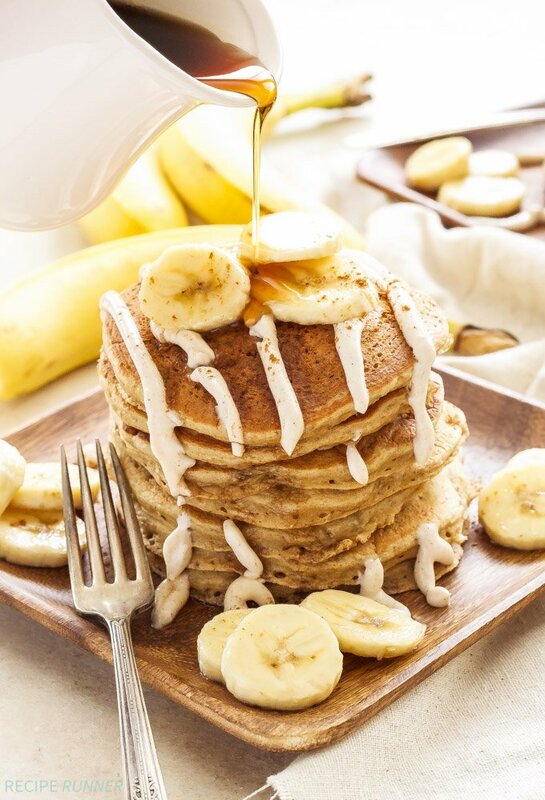 Serve the pancakes warm topped with the cinnamon cream cheese glaze, maple syrup and sliced bananas. In a small bowl whisk together all of the ingredients until smooth. Make sure that the cream cheese is soft so that the glaze isn't lumpy. This post was sponsored by Blue Diamond Almond Breeze Almondmilk. As always all opinions are my own. That is a gorgeous stack of pancakes! Perfect for our weekend breakfast plans! Pancakes are one of my favorite weekend treats! Oh my word!! I can just imagine taking a bite and these tasting just like banana bread. 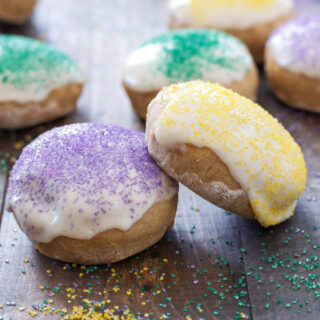 And that cream cheese glaze--so good! Oh wow, these pancakes look so delicious! This looks delicious. Both the pancakes & the glaze would be much healthier if made with full-fat Greek yogurt & full-fat cream cheese, both of which are healthy fats. The low-fat or non-fat versions are higher in carbs, ergo, higher in sugars. So, I adore pancakes and I adore banana bread - and now I don't have to sit there and try and choose and then feel guilty about choosing both - now I can have 2 in one! This is brunch done right! Saw these on FB today and they are even more glorious on the blog! these look like heaven!!! My husband is a banana freak, must make these for him!